New York, N.Y. 10016. Include any photos, drawings or logos if required. 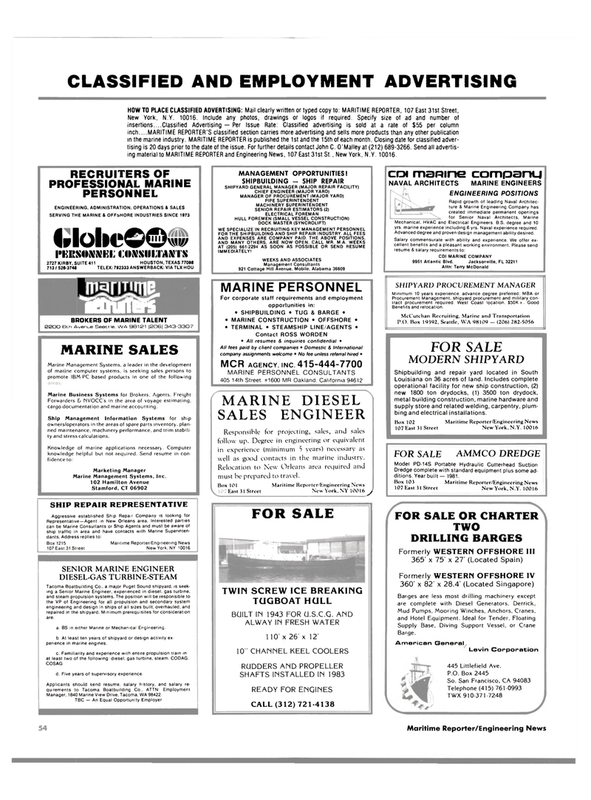 Specify size of ad and number of insertions....Classified Advertising — Per Issue Rate: Classified advertising is sold at a rate of $55 per column inch....MARITIME REPORTER'S classified section carries more advertising and sells more products than any other publication in the marine industry. MARITIME REPORTER is published the 1st and the 15th of each month. Closing date for classified adver- tising is 20 days prior to the date of the issue. For further details contact John C. O'Malley at (212) 689-3266. Send all advertis- ing material to MARITIME REPORTER and Engineering News, 107 East 31st St., New York, N.Y. 10016. Forwarders & NVOCC's in the area of voyage estimating, cargo documentation and marine accounting. Ship Management Information Systems for ship owners/operators in the areas of spare parts inventory, plan- ned maintenance, machinery performance, and trim stabili- ty and stress calculations. Tacoma Boatbuilding Co., a major Puget Sound shipyard, is seek- ing a Senior Marine Engineer, experienced in diesel, gas turbine, and steam propulsion systems. The position will be responsible to the VP of Engineering for all propulsion and secondary system engineering and design in ships of all sizes built, overhauled, and repaired in the shipyard. Minimum prerequisites for consideration are: a. BS in either Marine or Mechanical Engineering. b. At least ten years of shipyard or design activity ex- perience in marine engines. c. Familiarity and experience with entire propulsion train in at least two of the following: diesel, gas turbine, steam. CODAG. COSAG. d. Five years of supervisory experience. Manager, 1840 Marine View Drive. Tacoma, WA 98422. AND EXPENSES ARE COMPANY PAID. THE ABOVE POSITIONS. Responsible for projecting, sales, and sales follow up. Degree in engineering or equivalent in experience (minimum 5 years) necessary as well as good contacts in the marine industry. Relocation to New Orleans area required and must be prepared to travel. Mechanical, HVAC and Electrical Engineers. B.S. degree and 10 yrs. marine experience including 6 yrs. Naval experience required. Advanced degree and proven design management ability desired. Louisiana on 36 acres of land. Includes complete operational facility for new ship construction, (2) new 1800 ton drydocks, (1) 3500 ton drydock, metal building construction, marine hardware and supply store and related welding, carpentry, plum- bing and electrical installations. Dredge complete with standard equipment plus some ad- ditions. Year built — 1981. Levin Corporation 445 Littlefield Ave.